Comfortable, flexible and offering exceptional warmth, the Flexitog Blue Ridge Sherpa Fleece Thermal Mittens FG23 are designed to excel in harsh environments such as those in a freezer. The dexterity provided by the Blue Ridge Mittens makes them ideal for picking work, while their high standard of construction means that the mittens deliver high-quality performance for years of use. 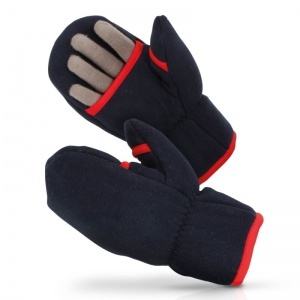 The Blue Ridge Sherpa Mittens offers exceptional comfort and flexibility, while their inner fleece lining ensures that the user will stay warm during use. Their impressive flexibility makes them ideal for extended picking work, where the warm and padded design promise to keep the user comfortable throughout use. The Flexitog Sherpa Fleece Mittens are available in one size that should be suitable for most users because of the flexible nature of the design. To find your perfect pair, please measure the circumference of your palm and match the results to the table below.